Comedy sequels love taking the show on the road - think Vacation in Europe, The Hangover in Thailand, and The Bad News Bears in Japan - as a way to wring a few more laughs out of the same basic premise. So, naturally, Ace Ventura: When Nature Calls features the world's greatest pet detective on a mission in an inexplicably colonial corner of Africa. But make no mistake: this is a completely different and oddly more kid-friendly film than its predecessor, doubling down on the sight gags and relying even more heavily on the quotable hyperactivity of its main character. 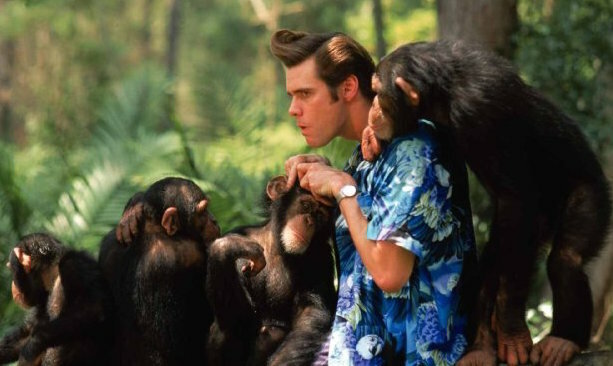 Credit the zany spark of writer-director Steve Oedekerk, as well as what might be the most committed comedic performance of Jim Carrey's career. Also, we're proud to welcome guest commentator Nate Tapp for his first appearance on the podcast. Ready to start listening? Alllllll righty then!